Rising sea temperatures have wrecked the Great Barrier Reef's ability to regrow, researchers said Wednesday, highlighting for the first time a 90 percent fall in new corals since back-to-back heatwaves bleached the World Heritage site. Following the unprecedented loss of swathes of the reef—the world's largest living structure—in successive ocean heatwaves in 2016 and 2017, the number of new corals measured a year later was found by a team of scientists to be 89 percent lower than historical levels. Coral reefs make up less than one percent of Earth's marine environment, but are home to an estimated 25 percent of ocean life, acting as nurseries for many species of fish and a habitat for birds, sharks, dolphins and porpoises. 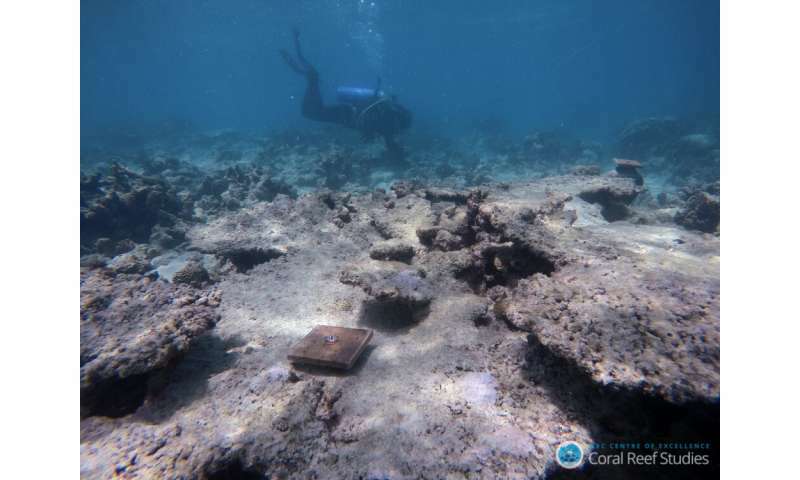 The study measured how many adult corals survived along the 2,300-kilometre (1,400-mile) reef, off the northeast coast of Australia, following consecutive summers of unusually warm seas that bleached and killed off numerous coral species. It discovered a "crash" in coral replacement compared to levels measured in years before a mass bleaching event. The population of one species—Acropora, a branching coral that supports thousands of marine species—tumbled by 93 percent. "We never thought we would see disturbance on a scale to affect recruitment to this extent," said Andrew Baird, co-author of the study that appeared in the journal Nature. The team estimated that it would take between five and 10 years for the reef's production of baby corals to fully recover—but only if there isn't another bleaching event. 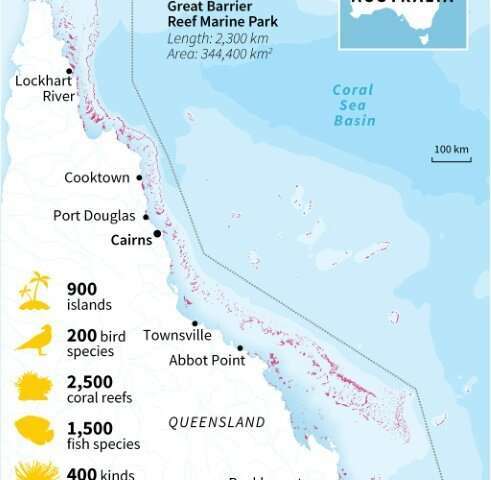 Map and factfile on Australia's Great Barrier Reef. Atmospheric temperatures have risen by around one degree Celsius (1.8 Fahrenheit) since the middle of last century, and coral is uniquely sensitive to fluctuating heat levels. Last year an expert panel of international climate experts warned that coral structures—including the Great Barrier Reef—would most likely not survive a 2C rise. Bleaching occurs when warmer ambient temperatures cause coral to expel tiny photosynthetic algae, draining them of their colour. The Great Barrier Reef has experienced four mass bleaching events in recorded history—all within the last two decades. "Dead corals don't make babies," said Terry Hughes, director of the ARC Centre of Excellence for Coral Reef Studies at Australia's James Cook University. 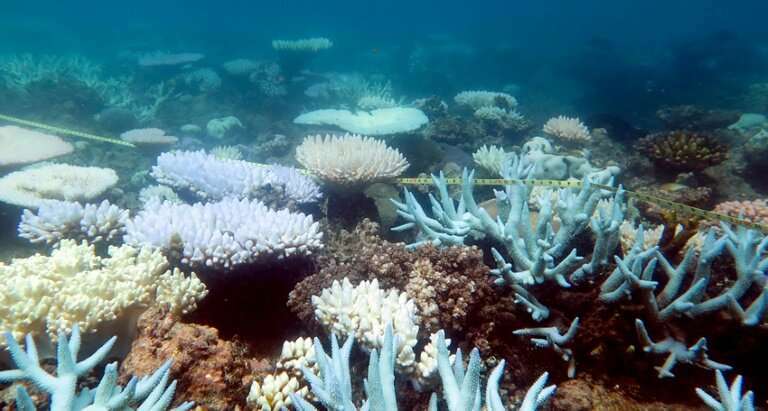 "Fever babies means recovery will be slower, and the shift in species means the reefs will not recover to the same configuration as before," he told AFP. "The question is, will that recovery be interrupted by another mass coral bleaching event due to escalating global warming?" Hughes said there may however be some hope, as evidence suggested that some coral species are more resilient to temperature fluctuations than others. The team found that while bleaching occurred in both 2016 and 2017, it took much greater heat exposure to cause the same level of bleaching the second time around—meaning the reef was naturally adapting to house more heat-tolerant coral varieties. "So the reef is now moving rapidly to a new configuration, with a greater proportion of the species that are resistant to bleaching, or that are capable of bouncing back the fastest," Hughes said. The number of species, however, would likely be greatly reduced, earlier research has shown. Co-author Morgan Pratchett however warned that there was a limit to the amount of warming the reef could take. "It's highly unlikely that we could escape a fifth or sixth (bleaching) event in the coming decade," she said. "We used to think that the Great Barrier Reef was too big to fail—until now."